If most of us reading this were passengers on US Airways Flight 1594, we’d be thanking G-d that we’re still alive. But not Joe Hart and several other passengers who landed in the Hudson River two weeks ago, instead of dying in a crash. They are consulting attorneys. And since they can’t sue the birds that caused this, they’ll sue US Airways. It’s the “deepest pockets” pursuit, which motivates America’s ever-growing litigation explosion. 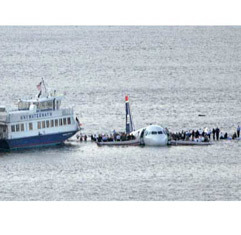 Many US Airways (LCC) passengers who endured a crash landing in the Hudson River . . . say they appreciate the $5,000 that the airline has offered – but some say it’s not enough. It’s too soon after the accident to determine what emotional distress he has suffered, he says. He’s one of 150 passengers who were dramatically rescued Jan. 15, when the Charlotte-bound Airbus A320 jet safely ditched into the frigid river off Midtown Manhattan. A pilot on the plane told air-traffic controllers that birds struck the plane before both engines failed after takeoff from New York’s LaGuardia Airport. After the crash, US Airways sent passengers a letter of apology, a $5,000 check to assist “with immediate needs” and reimbursement for the ticket. Exactly how much compensation is appropriate is a question after crashes. The National Air Disaster Alliance & Foundation, a safety advocacy group, says $5,000 is not enough. . . .
Hart and another passenger, Dave Sanderson, say they each left more than $5,000 worth of items on the plane. 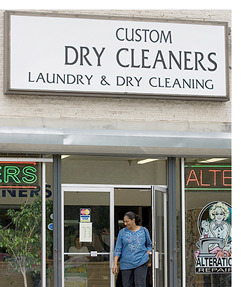 Nothing wrong with insisting on being reimbursed for the entire cost of your items. But that’s not what this is about. Some passengers will be suing for far more than the value of their items. US Airways Vice President Jim Olson says that an insurance claims specialist is contacting passengers and that they’ll be reimbursed for expenses or losses above $5,000. The airline wants to ensure no passenger is “losing money for the inconvenience or anything lost during the accident,” he says. . . . He says he was tense, sweated and “felt every bit of turbulence” on a Los Angeles-to-Philadelphia flight last week, though it wasn’t that turbulent a flight. Hart says he has talked to a lawyer in North Carolina but hasn’t decided whether to take any legal action. The firm’s lawyers are determining what injuries and emotional distress passengers may have suffered, and what parties might be liable under New York state law, says Noah Kushlefsky, a partner in the firm. Um, we know who is “liable”: birds who disabled the plane’s engines. Mr. Hart and his lawyer need to ask the birds whether they “understand the significance of the incident.” I think US Airways understands its significance quite well. Sadly, Mr. Hart doesn’t understand the significance of being fortunate enough to survive against the odds. It only follows, then, that the pilot sue every passenger for the cost of saving their lives. Did the pilot not suffer any emotional trauma, and job stress in the attempt to save them all? Better yet, let’s all sue the last American firms still standing. We can make up anything, and some greedy attorney will take it on. Then there’ll be more jobs lost, and further economic calamity. Nowdays, it seems to be the American way to destroy America from within. I posted this before…I think they are suing the wrong group….they birds ran into the plane, arent’ they they ones to sue. It wasn’t the pilots’ – or the airline’s fault. Those victims who are wont to sue ought to reflect on the fact they wouldn’t even able to sue if they were dead. We have raised a thankless generation in this country. The blessings of life is what we should thank G-d for and we should thank – not sue – the people who do save our lives. We need to get in the habit of finding goodness in life instead of constantly finding fault with it and blaming every one around us when things do go wrong since if every thing was perfect in life, no one would ever have a grievance with it. I can’t believe some of these people want to sue, doesn’t surprise me but WTF. THese people should be thankful they’re alive. And it’s not like it was the airlines fault, due to faulty equipment. Accidents unfortunately happen. And the people should realize this. It wasn’t anyones fault in this situation. I hope a judge throws this case out of their court room. There is a time to sue and not a time to sue. This is a time to NOT sue. And it appears US Airways is doing everything they can to accomadate the passengers. As for people who claim they will have problems flying again. Well, then they can find alternative means of transportation. No one is forcing them to fly again if they don’t want to. If I was a passenger on this flight I would be thankful for having such an experience pilot. And be sending him gifts and not asking for anything in return. And come on who has more than $5K in valuables in their luggage. Some people make matters worse. And they should be ashamed for being seen as greedy idiots. Nothing is good enough for them, they just have to have more. Yeah, I [publicly] predicted this the second I heard there were survivors. Of course, it didn’t take a whole lot of insight to make that call, but I was rebuked for suggesting such. I don’t see why they should even be reimbursed for their belongings. If the airline wasn’t responsible for the crash, it shouldn’t be their problem. Tenn I agree with you 100% How do you have over $5000 worth of merchadise on the plane? What did you pack your jewerly in you baggage, how can you provethat some bag handler did not steal it before it even got on the plane. It’s not like they were going to Vegas and maybe they had some Elvis Jump Suits in their baggage! Good old lawyers and big victim class of American society! This is one of the biggest problems in America and I’m not talking about the planes! These trial lawyers are nothing but a bunch of scum sucking bottom feeders! What we need is for the law to allow judges to fine law firms for bringing this type of suit, and prohibit the law firms from passing on these fines to their clients. If the law already allows for these fines, then why aren’t judges enforcing the law? The fastest way to be rich in America is to sue. Sue anybody for whatever reason. It doesn’t matter. Just sue. If you have crooked lawyers and a broken judicial system that you know they’ll work in your favor, why not? In these bad economic times, the only way to get out of debt is to sue. Last year I sued a Chinese restaurant because I paid for 2 egg rolls and they gave me only one. I sued their asses. Now they’re out of business, and back to Shanghai. Chances are you’ll stumble upon some illegal aliens. Sue their asses and they’ll be deported. And that’s how you can contribute to solving the illegal aliens problem in America and be rich at the same time. How pathetic-instead of being glad to be alive, they are suing them for ’emotional” distress. We have become a bunch of crybabies. I’d like to thank that crew and piolet personally. The $5k that the airline is giving the survivors is generous enough. Trying to cash in when they should simply be glad to be alive is predictable, but disgusting. For consideration: when one purchases an airline ticket is that not the same as entering into a contract? Perhaps it literally is a legal contract, I don’t know. The airline agrees to deliver the passenger and a prescribed amount of baggage from point A to point B for an agreed upon price. I would think that there is wording in the purchase agreement to limit the airline’s liability resulting from ‘acts of God’. The airline did not fulfill the contract and needs to make the passengers whole. This would include, but not necessarily be limited to reimbursing the cost of the ticket and replacement of luggage. Airlines typically have policies for replacing lost luggage, it doesn’t take a disaster or an ‘act of God’ to lose someones bags – it happens regularly and there are protocols to handle it. Medical expenses should be considered too. I recall one passenger suffered a broken bone. Not everyone has health insurance. If everyone can be properly compensated for their actual monetary damages without litigation then that’s how it should be. It’s because of this kind of crap we have jokes about bus drivers backing up and finishing the job. I wish at least on survivor will state that are thankful for the airline and decline to sue. Hopefully one survivor will publicly call other freeloaders. Take your $5000 and be grateful you were flying on a plane whose pilot is an honorable man. Freeloaders never get enough or are ever satisfied. I love that caricature of d-bag lawyers. Obviously this was meant for Johnny Cochran. Thanks, Debbie, I haven’t seen Seinfeld in a couple years. And it has been over 10 years since the last episode. If they don’t survive, they can’t sue. C’mon, Joe. Cowboy up and grow a pair. Get down on your knees and thank God and Chesley Sullenberger that you’re alive. Because of Chesley Sullenberger and the mercy of the Almighty you get to live the rest of your life. You oughtta be celebrating and savoring every damned day now, ’cause Chesley knew how to fly that plane. So stop being a goddam crybaby and grow up! You make me want to puke. I knew the lawyers would quickly get into the picture and it is the American way to sue for compensation. I hope the judge throws this one out of court!